Just in time for the Christmas season, a very creative mom came up with her very own Christmas tag. Thank you so much, Willa of Smart Mommy, for handing me this tag. 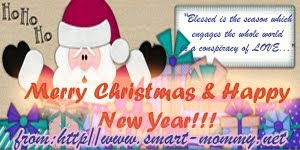 Advance Merry Christmas and Happy New Year to you, too! I’m also thankful to Mommy Jac of Mom’s Special Diary for giving me this Thank you for Blogging Award. I’m really honored to receive yet another award from you. Thanks for always thinking of me. 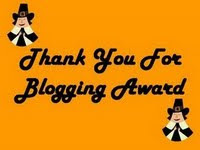 Now, I’m passing on this award to the following awesome bloggers: Santhy, Darly, Karen, Ela, and Nessa. This entry was posted in Awards, Blogging, Christmas, Tags. Bookmark the permalink.